Today, I have an excellent companion planting chart to share with you. But first, let’s briefly get into what companion planting is and why it can be useful. Companion gardening involves pairing plants that work well together. I’ll use the 3 sister guild as an example, which are 3 plants that were originally combined by Native Americans in such a way that the plants all helped each other out. Corn. Provides a support for the beans. Pole Beans. Provide nitrogen for the soil. Squash. Leaves hug the soil to decrease weeds and evaporation. This is an excellent example of vegetable companion planting. They all help each other, and they even work together to make a reasonably balanced meal. Is The Companion Planting Guide Scientific? Of course, much of the vegetable companion planting chart is not hard science. Skeptics are quick to point out that a lot of this stuff comes from anecdotal evidence, which is partially true. Fortunately, when the anecdotal evidence comes from tens of thousands of gardeners and farmers over the last century and beyond, we know there’s something to it. Science is great, but when we rely on it as the only answer, we can get into trouble. Now, if I accidentally plant my onions right beside my beans, it’s probably not going to be a big disaster. And if I plant those onions next to my tomatoes instead, I’m not going to double my yields. The rules at play here are more subtle, and it probably depends on many environmental factors. But I’ve seen the effects of companion planting vegetables, so I follow many of the guidelines. It certainly doesn’t hurt. That doesn’t mean I don’t break the rules, but I do find them to be a nice starting point when I’m planting every spring. It helps establish a bunch of potential groupings. Otherwise, it can be difficult to know where to begin when laying out 50 different crops in my organic garden. As you probably know, a monoculture is a big garden or field of just one crop, while companion planting looks at 2-3 plants. 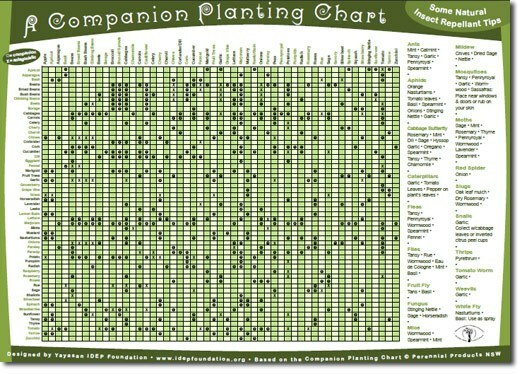 The companion planting chart refers to how any two given plants will interact with each other. 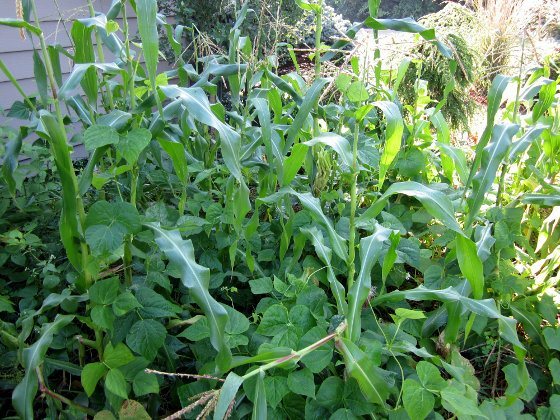 A polyculture, on the other hand, blends many plants together. It produces many unknown interactions between, just as in nature. In it’s simplest form, it just means that we combine a bunch of plants together in the garden in order to increase overall biodiversity and make use of different niches in the garden. So we plant some root crops, groundcovers, herbs, bigger plants, and so on, all together. They’ll have different root systems and different above ground heights. Some grow tall and provide shade and others hug the ground. 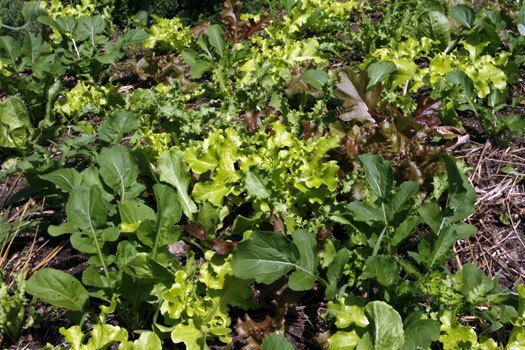 Some are ready for harvest early, while others wait a while, even within the same food group, such as lettuces. With a lot of experimentation and observation, you can hit upon a collection of crops that work well together for your organic garden. But even without all the planning, simply by combining these plants, we get increased biodiversity and the benefits that come with that. We’ll have reduced yields on some plants and others may not do well at all during the experimentation phase, but we should have better overall garden health and often improved yields overall. I don’t do straight, monoculture rows in my vegetable garden anymore. Each bed may have 10-20 plants all mingling together, perhaps 15 food plants and 5 beneficials such as wild marigold, nasturtium, yarrow, chamomile, bee balm or any number of others. So if you usually plant straight rows, you may want to experiment with a polyculture this fall or next year. These combinations aren’t carved in stone, but the chart is a great starting point. It was designed by Yayasan IDEP Foundation (based on the Companion Planting Chart © Perennial Products NSW). Right-click on it to save it to your computer (save the link, not the image, in order to get a full page pdf). Any questions? Let me know in the comments below. Do you do any companion planting? Roses and strawberries get along quite well. Wear long sleeves when picking berries however. Yes, many weeds are incredibly beneficial, especially lambquarters. Phil, The chart looks great but it’s impossible to read even using the link. Can you post it as a PDF? I did not see a link offered when I right clicked and the image came down that is really too small to read. If you click on the image, it’s a full page pdf, so pretty easy to read. You can zoom in if necessary. Open the link as Phil suggests then from that page right click the image and save it as a Doc or PDF or JPEG to your hard drive. Then you can open it and expand it as much as you would like. I just did that and it worked fine for me. Good luck! Phil is there another chart on which ones are root crops, groundcover, herbs, and bigger plants. I know the common ones but there are a lot I do not know. It would be nice to have for my garden map. What is a root crop by the way? Hi Chelly, do you have that other chart in digital format? I’d love to see it.Examples of root crops are potatoes, carrots, beats, radishes, sweet potatoes, etc.. We eat the part of the plant that grows underground. Phil – I think it was more a question than a statement. In your July 5th post under the paragraph Polycultures is your statement “So we plant some root crops, groundcovers, herbs, bigger plants, and so on, all together.” Chelly is asking if there is a cross reference for the chart that classifies the listed plants. Someone would have to create it and post it. Ah yes, I read “there is” instead of “is there”. I haven’t done much greenhouse growing, so I can’t give any advise on that. But remember to create healthy soil so that the aphids don’t come in the first place, and don’t use too much nitrogen. What is the difference between the vertical and horizontal axis. The same item has different companions. The axes should be the same. There may be a couple of errors in there. Hi Phil,This chart is a great help for laying out my garden. I am new to this site and was wondring if you have something somewhere to tell me about planting watermelons, canteloupes and pumpkins? Thanks for all this information. Sorry, I don’t talk about planting specific plants on this site, but there is lots of info online. Do the colors on words or squares mean anything? No, it’s just to make it easier to read. I think I’ve got it now…move the annuals about and the bio-diversity takes care of the pests. My allotment is going to be so beautiful! Excellent point. I rotate the main crops which I grow a lot of and which seem to be more susceptible to pests. Tomato and squash and brassica families for example. The plants I interplant are mostly herbs, flowers, allium family, lettuces/greens. I always plant pole beans, squash and nasturtiums together. Corn attracts raccoons here, so I don’t even try it anymore, but the other three do really well together. Radishes and parsnips self-seed everywhere. I read somewhere, and therefore think their flowers attract the predator wasp that attacks cucumber beetles, as well as aphids, so I leave some of those also. I let the radishes bloom and they do attract beneficials as well as sidetrack a few bad bugs. Just pull them out before the seed pods open or you’ll have radishes galore! Thanks for verification on that. The airy radish flowers are lovely by themselves, but it’s good to know they are working too… And, yes, easy to pull out, being so tall… I probably leave more than required, but it’s another thing I don’t have to think about planting early, as they just show up, and the extra seedlings become mulch… Same with borage, which mulches the tomatoes. I do not see hot peppers or orka on this list ??? How close or far away do plants have to be for positive and negative effects? Depends on the plants and on the reason for the positive/negative effects. I’d say 6 feet is a good buffer most of the time. Lots of interesting varietals on here……but no peppers?!?! Guess not. I wonder if they’re similar to tomatoes? Anybody know if I can plant tomatoes where I planted Dahlia flowers the year before? I’m not sure about that. Have you come across some information suggesting you shouldn’t? Thanks Ian. Unfortunately, it’s not my chart. Thank you so much, your article is really interesting and your chart mega helpful. I have just inherited an allotment I have never had a garden before and am looking forward to growing vegetables and fruits for my small family. This organic companion guide is extremely useful. Thanks for your time and effort.